Writer, photographer and adventurer Berne Broudy began her career as a bike and hiking guide, with sidelines in international development and sustainable forestry. Berne spent a decade guiding and globe trotting in Europe and the Americas. After one of her clients prematurely ejected off a chairlift into a pile of rocks on a south American volcano, she was left with a herd of Bolivian llamas to deliver to their non-existent mountain top corral, and she had guns pulled on her at least three times in foreign countries, she knew the stories were too good not to tell. Berne has photographed on five continents and logged endless miles to get her shots on Vietnamese long boat, Asian rickshaw, Mongolian camel, Russian military vehicle, sea kayak, telemark skis, Chaco sandals and various contraptions with 24”, 26” and 29” wheels. The biggest influence on Berne’s work has been her passion for the outdoors, and her desire to be in the heat of the action without being the one in danger of breaking all her ribs on a missed landing. Though her new year’s resolution was to get more air, she really prefers to be on the ground capturing other’s big air. 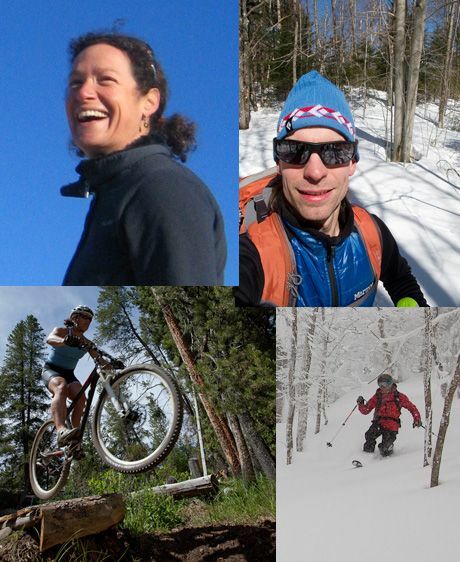 Broudy, an avid conservationist and mountain biker, sits on the outreach committee of the Conservation Alliance and on the boards of Fellowship of the Wheel and VMBA. Mike Donohue has traveled the word capturing dramatic landscapes, natural phenomena, extreme sports, and everyday life. As long as Mike can remember he’s taken pictures and played in the woods. He first picked up his Kodak Instamatic at five years old while cross-country skiing with his parents, and he's been hooked on photography and the outdoors ever since. A climber, biker, skier, hiker, paddler and most recently motorcyclist, Mike has carried everything he needs to live and shoot for months at at time in haul bags, panniers and on his back up El Capitan, to the summit of Mt. Rainer and down rivers and trails in North and South America, Europe and Asia.